As the Syrian Army consolidates its gains following its success in retaking the city of Aleppo, it is slowly turning its attention to Idlib Governorate, the next major stronghold of the various opposition groups. Idlib has become the new center of the Syrian revolution. The Syrian Army is stretched thin - it is about half the size it was prior to the outbreak of the Syrian civil war in March 2011. It has been wracked with defections, desertions, and battlefield losses. Without the support of its foreign allies, it is doubtful that it could be considered a viable combat force. The Syrians' principal supporters are Russia (air, air defense, missiles, field and rocket artillery, special forces), Iran (special forces, troops, logistics, air bridge resupply), Hizballah (troops), Iraq (Shi'a militias) and Afghanistan (Shi'a militias). Over half the combat power of the forces supporting the regime of President Bashar al-Asad are foreign. Immediately after their success in Aleppo, most military analysts believed that the Syrians would turn their attention to Idlib Governorate - it made sense. One of the main reasons is to secure a reliable and direct main supply route between regime-controlled territory around Hamah and the newly "liberated" areas around Aleppo. The main highway through Syria, from the Jordanian border in the south to the Turkish border in the north is officially called the M5 or the International Highway - most people just call it the Aleppo highway. On the map, it is clear that the opposition controls a small section of the highway between Homs and Hamah, and almost all of the highway from just north of Hamah to the outskirts of Aleppo. Because of the opposition control of major sections of the highway, the Syrian forces must use a secondary road from Homs to the northeast through al-Salamiyah, then north to Syrian forces in Aleppo - note the thin red line on the map. It is not a great road (I say this from personal experience) and has been cut occasionally by the opposition. Becuase of the importance of this line of communication, the Syrians make every effort to regain control quickly. Militarily, it is not an ideal situation. Immediately after the retaking of Aleppo, Syrian forces began to move east from Aleppo towards the city of al-Bab, most likely in preparation for an eventual assault on the self-proclaimed capital of the Islamic State in Iraq and Syria (ISIS). The Russian Air Force, operating from Humaymim air base just south of Latakia, however, diverted the bulk of its attack sorties to rebel-held cities in Idlib Governorate. North of Aleppo, the opposition consists of Free Syrian Army (FSA) units backed by the Turkish army and air force. In a rare instance of cooperation between the regime and the Syrian Democratic Forces (SDF), the joint Syrian Kurdish and Arab force backed by the United States, the opposition forces have been contained in an enclave along the Turkish border, effectively marginalizing the Turks. See my earlier piece, SYRIA: Has Turkey been marginalized and the Americans thrust into the fight? The Syrians also mounted an assault on the ISIS-held city of Palmyra, ostensibly an attempt to open the road to Dayr al-Zawr on the Euphrates river. 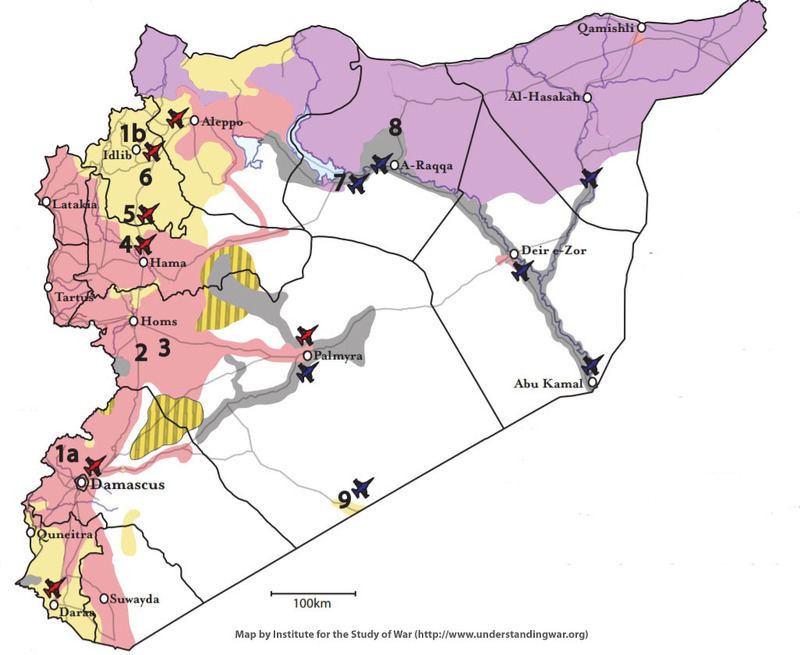 The city, with a Syrian air base and large army garrison, is surrounded by ISIS. Control of Palmyra has gone back and forth between the regime and ISIS - currently, it is in the hands of the regime. The regime appears to be maintaining its positions in the Palmyra/east Homs Governorate area, but is only slowly advancing, if at all, towards Dayr al-Zawr. The Syrian military in the besieged city is being kept alive by supplies airdropped by Syrian, Russian and Iranian military cargo planes. The civilian population in the surrounded enclave are resupplied by United Nations airdrops. It appears now the Syrian military is finally focusing its main effort in Idlib Governorate. This makes sense - the Syrian regime can seek to reduce the opposition-held areas on the Homs-Aleppo axis while maintaining its positions to the east. Although ISIS controls a large area of Syria - about one-third of the country - the organization is steadily losing ground to the SDF. The SDF has isolated the city of al-Tabaqah, home to Syria's largest dam and an airbase - part of the larger strategy to encircle and then attack al-Raqqah. 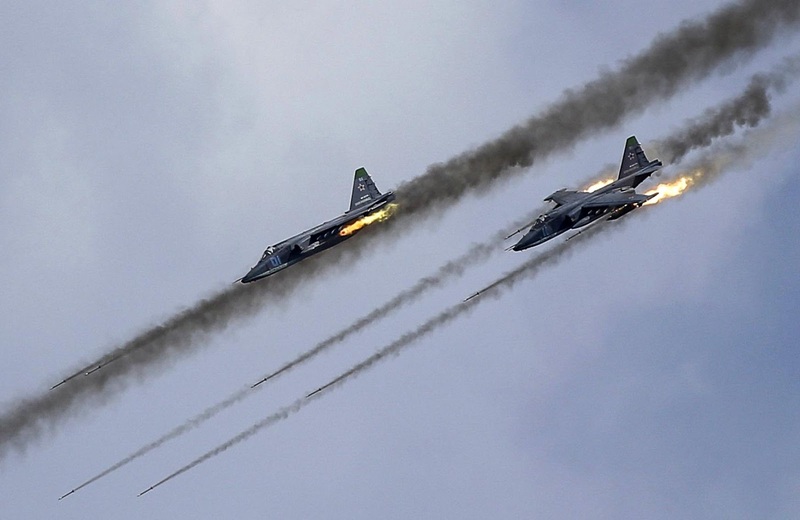 In the fight in Idlib Governorate, we have seen a significant increase in both the quantity and lethality of air strikes, especially by the Russian Air Force. Fully 75 percent of all sorties flown in Syria on behalf of the regime are being flown by the Russians. Syrian Air Force sorties have decreased following the American missile strike on al-Sha'yrat air base, in which over 20 aircraft (SU-22 and MiG-23 fighter-bombers) were destroyed. Those losses represent about 20 percent of the Syrian Air Force's operational fighter inventory. Since the April 4 Syrian chemical attack on Khan Shaykhun and the retaliatory American missile strike on April 7, the Russians have increased the use of both incendiary cluster munitions and thermobaric weapons. Both of these weapons are extremely destructive and lethal, causing large numbers of civilian casualties and major damage to the infrastructure. It also appears that the Russians and Syrians both are continuing their systematic attacks on hospitals and other medical facilities, now in Idlib Governorate just as they did in the battle for Aleppo last year. The Russians have been deliberately attacking medical facilities since at least early 2016, and likely since their forces arrived in Syria in September 2015. See my earlier piece on these war crimes, Russian Air Force targeting hospitals - war crimes, Mr. Kerry? 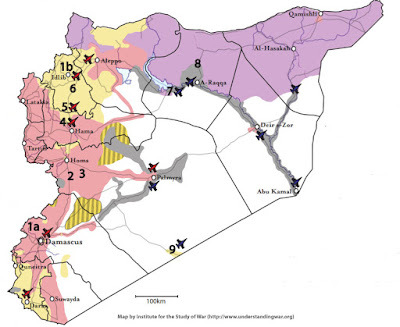 Idlib Governorate is becoming the primary location for the various groups that comprise the Syrian opposition. This includes, among others, the FSA and other non-Islamist groups. There is also a major presence of several Islamist groups, notably the former al-Qa'idah affiliate known as the Hay'at Tahrir al-Sham (HTS). HTS was formed by a merger of several Islamist groups and has emerged as the key opposition group after the FSA. Two other Islamist groups, Jaysh al-Sham and Ahrar al-Sham, are also involved in the fighting in Idlib. Accurate numbers are hard to determine, but the two sides are probably close when it comes to personnel. However, the Syrian Army is supported by large amounts of Russian airpower, as well as Iranian and Hizballah forces on the ground. Since the fall of Aleppo, the regime has held the upper hand on the battlefield, slowly reducing pockets of opposition resistance. The army will continue to mount attacks on rebels in the Idlib pocket until they have them surrounded and cut off. At that point, there may be an opportunity for a negotiated solution. We have seen a willingness on the part of both sides to reach agreements whereby the government forces assume control of an area in return for free passage of opposition fighters. The opposition fighters, with a few exceptions, are transported to locations in Idlib Governorate. That only works until there is no place left to go. I have said in the past that given the Russian commitment to the regime of Bashar al-Asad, it is highly unlikely that the opposition will be able to win a victory on the ground. The fighting in Idlib will likely follow the template of the fighting in Aleppo. The Syrian military, backed by its allies, will isolate and besiege pockets of opposition fighters, attack them with overwhelming air and ground delivered firepower until they are forced to surrender. The battle for Idlib? It is only a matter of time. If Bashar al-Asad can restrain himself from further use of chemical weapons and maintains the support of the Russians and Iranians, he will eventually reassert control over the entire Idlib Governorate. After that, the remaining pockets of resistance - the eastern suburbs of Damascus, some isolated pockets in southern Syria and a small presence in the north, will fall as well. As for Bashar al-Asad and the Russians - as we used to say in Pittsburgh - "he owes them big."